What Is the Value of My Lawsuit Case? What is the value of my lawsuit? What is the value of personal injury case? Although a routine and straightforward enough concern that many injured accident victims ask and want answered, there is really no routine and straightforward answer since there are several specific factors that go into determining the value of your personal injury lawsuit. Always remember that each and every bodily injury case and personal injury lawsuit is uniquely different. However, there several factors in determining the value of your lawsuit case, we will discuss the number one factor in determining the value of your lawsuit case on this page. From a practical point of the view, the number one factor in determining what a personal injury case is worth, despite what you may think, is the available insurance coverage. In the situation of a car crash accident, this would be the available amount of insurance on the at-fault vehicle(s), on your "own" vehicle, and overall. Why is that? Look at the following scenario: Party A is involved in car accident with Party B in New York. Party A rear-ended Party B. Party B sustained serious injuries including a fractured femur (thigh bone) requiring surgical implantation of plates, rods, and screws. In the aforesaid scenario, Party B was not at-fault for the accident because he/she was rear-ended. Additionally, Party B sustained a serious injury because a large and force or extensive trauma is required to break this bone. However, if Party A only had the $25,000 minimum amount of insurance coverage that is required in New York then that is the most amount of money Party B could get from his/her lawsuit case (SUM equal). Therefore even though you were not at-fault for your accident and sustained a serious accident, the strongest determining factor of the value of your bodily injury claim and personal injury case is the amount of available insurance coverage. However, the level of insurance coverage is less of a factor when dealing with commercial defendants and large trucking companies that tend to typically have larger insurance limits. As a protection to innocent car crash victims injured in motor vehicle accidents, bus accidents, trucking accidents motorcycles, bicycle accident, pedestrian, and hit and run accidents, many insurance counselors and personal injury attorneys often recommend that consumers purchase higher levels of uninsured and underinsured /SUM insurance coverage through their auto insurance company. There are several other factors in determining how much your case is worth. The goal and purpose of this page is to help and inform injured accident victims in personal injury cases. Nirvana Legal Solutions provides financial assistance to injured accident victims offering a wide variety of settlement funding products. 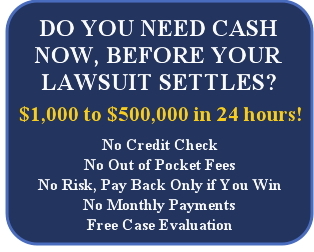 We provide low lawsuit loans rates on accident cash advance, settlement loans, lawsuit cash advance, loans on accidents, settlement loans, car accident lawsuit funding, auto accident loans, lawsuit funding, pre settlement funding, auto accident lawsuit funding, loans on insurance settlements, accident loans, lawsuit cash advance, loan on settlement, auto accident loans, pre settlement loans, borrow money from pending lawsuit, auto accident loans, and surgery lawsuit funding. Nirvana Legal, helping plaintiffs stay afloat!